The old Acura TL was a very good car, especially in Type S trim or with the latter 3.7-liter V6 with SH-AWD and optional six-speed manual transmission. Acura replaced the TL (and the TSX) with the new TLX, and we don't think that the new car has captured the magic of its predecessor. 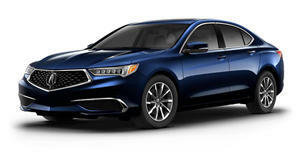 Acura has been in a rut for a few years now, but based one what the company , we think that this slump may be ending soon. The TLX has the potential to be a great car, and we have five changes that we think would make it perfect. We've argued that bringing back Type S models would be a great way to improve the brand. Acura has concurred, announcing that it will finally bring back Type S models with an . The most powerful TLX model uses a 3.5-liter V6 with 290 hp. The new Type S models will utilize a twin-turbo V6 that will be exclusive to the Acura brand. Not much else is known about this new V6, but we'd love to see around 400 hp to make it competitive with Infiniti's twin-turbo V6. Acura needs a performance model to show that the NSX is still related to other models in some way. Type S models won't just improve the TLX, but the entire Acura brand.